The Clay County Historical and Arts Council is asking for your help in our restoration project to preserve the Old Jail Museum. It was built in 1912 and taken over by the CCHAC in 1974 to use as a museum. Besides being a historic building itself, it houses many historic treasures that represent the history of Clay County. The exterior of the building is badly in need of repair, especially the windows and the brickwork surrounding them. Other repairs include the metal bars, replacing the exterior wood on Dr. Killian’s office and the kitchen with hardy board and repainting the entire structure. We hope we can count on your help with this restoration project. You may want to be a sponsor replacing one of the eighteen windows with a donation of $1500, or you may prefer to make a donation to the general restoration project. Your gift may be in memory or in honor of someone who has taken pride in preserving the history of Clay County. Several family members may combine donations to purchase a window to honor someone. A plaque will be placed in the museum recognizing all donations of $50 or more. Call 828 389-1401 if you would like more information. Our goal is to have this project completed by the end of May when the museum normally opens for the summer season. You may make your donation using your credit card by clicking the button below. You do not need to register or join PayPal to do so. 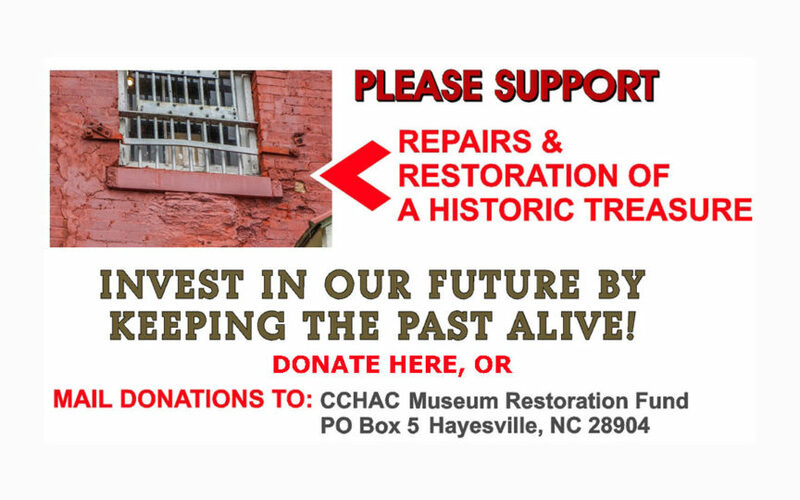 You may also send your check payable to CCHAC Museum Restoration Fund, P.O. Box 5, Hayesville, NC 28904.